Tired of buying box after box of those little, yet surprisingly expensive organic bunny crackers, or worse box after box of the not so natural neon orange or rainbow goldfish crackers? I know I get sick of it. My son wants boxes of bunnies at $4+ a pop at times (yikes) but it's not like I want him eating food coloring or GMOs, so I spring for the organic. That said, after some searching, I was pretty pleased to find a homemade goldfish cracker recipe. It wasn't an organic recipe, but that's easy to fix. More than just cute, these homemade organic cheese crackers are ultra-portable, have zero fake colors, come without the excessive packaging and best of all, actually taste good. I've never liked cheese crackers, yet, these are tasty enough to please me, at least, more so than the average cheese cracker. If you already love cheese, these are sure to be a hit for daily munching, at a party or even as a gift. If you have a food processor grab it. If not, hand mixing with a simple pastry blender, as I did, will work just fine. 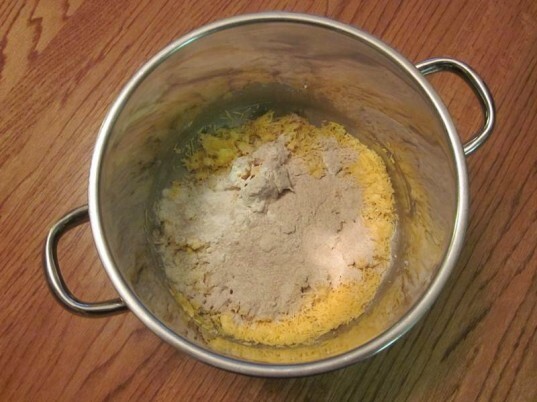 Combine 1 and 1/2 cups grated organic sharp cheddar cheese, 4 tablespoons organic butter (salted or unsalted is fine), 1/2 cup organic whole wheat flour, 1/4 cup organic all-purpose flour, 1/8 teaspoon garlic powder OR 1/8 teaspoon onion powder and 1/8 teaspoon salt. Start mixing with your food processor or by hand. After my dough started to become somewhat crumbly, as shown above, I quit using my pastry blender to mix. At this point I switched to my hands to mix the dough so I’d be sure to get everything universally mixed. Obviously, if you’re using a food processor, it will do the mixing for you. After mixing, you should have a nice light orange dough. If it’s too sticky, chill it a bit. I found this dough to be easy to work with right away, so I lightly floured my table, tossed my dough on there, and rolled it out. I rolled some crackers out to about 1/8 inch and some to about 1/4 inch. The thicker crackers were slightly puffy and a bit softer, while the thinner dough made for more traditional crackers. Personally, I liked the thicker ones better, but if you’re looking for totally traditional crackers, roll thin. After rolling your dough out to the desired thickness, you get to cut shapes. My son loved this part of the process, but me, not so much. 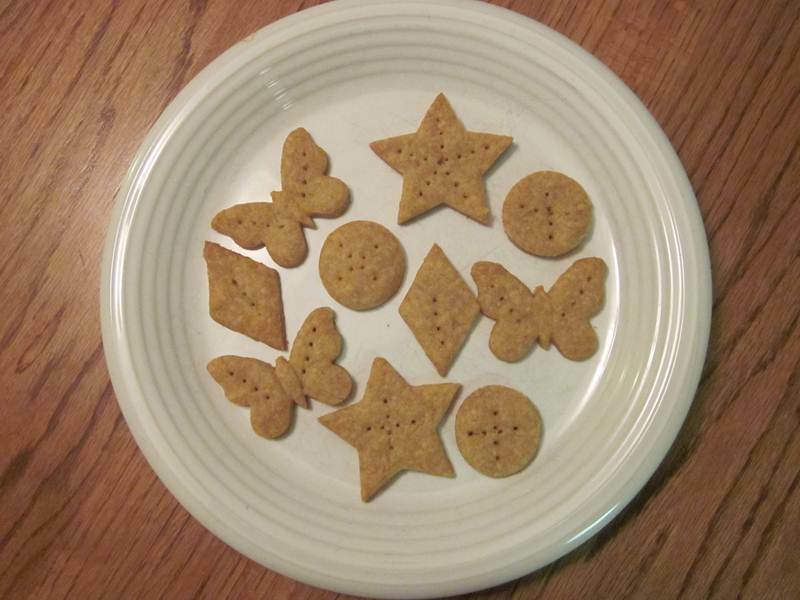 I’m glad I tried cute shapes once, because, frankly, the crackers turned out adorable. Still after all that work of cutting tiny shapes, I was beat. Thus, I decided to simply roll out the dough and slice squares in it with a pizza cutter from now on (much quicker). If you want to cut shapes, use the smallest cookie cutters you can find and dip the cutters in flour so that your dough doesn’t stick. 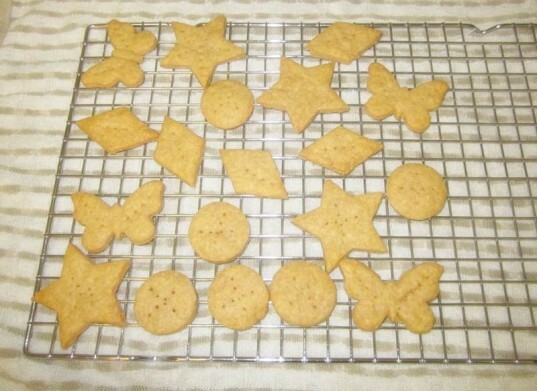 After cutting your shapes or squares, transfer the crackers to a prepared cookie sheet. You should line your sheets with a reusable baking liner or eco-friendly parchment. I was out of parchment so I used foil, which didn’t work as well. Poke tiny holes in your crackers to combat bubbles and overly puffy crackers. Bake your crackers at 350°F, for 12 to 15 minutes. Watch them closely. These are small and bake quickly if your oven runs hot. Once the crackers are just slightly brown at their edges, remove them from the oven and get them onto a cooling rack as quickly as possible. These crackers were a hit at my house. My son and everyone else who tried them, loved them. They were hyper tangy. If you don’t like so much cheese flavor, try using medium cheddar cheese or even branch out and try Swiss, Parmesan or another type. 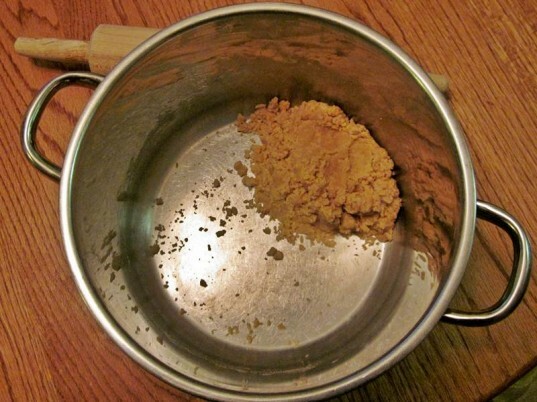 You can mix up the seasoning as well, for example, try Mexican cheese and a bit of chili powder. These crackers can be easily stored in cute little mason jars or other eco-friendly food storage containers. Your kids will gobble them up so fast, storage time won’t be an issue. Need more healthy snack ideas? After my dough started to become somewhat crumbly, as shown above, I quit using my pastry blender to mix. At this point I switched to my hands to mix the dough so I'd be sure to get everything universally mixed. Obviously, if you're using a food processor, it will do the mixing for you. After mixing, you should have a nice light orange dough. If it's too sticky, chill it a bit. I found this dough to be easy to work with right away, so I lightly floured my table, tossed my dough on there, and rolled it out. I rolled some crackers out to about 1/8 inch and some to about 1/4 inch. The thicker crackers were slightly puffy and a bit softer, while the thinner dough made for more traditional crackers. Personally, I liked the thicker ones better, but if you're looking for totally traditional crackers, roll thin. After rolling your dough out to the desired thickness, you get to cut shapes. My son loved this part of the process, but me, not so much. I'm glad I tried cute shapes once, because, frankly, the crackers turned out adorable. Still after all that work of cutting tiny shapes, I was beat. Thus, I decided to simply roll out the dough and slice squares in it with a pizza cutter from now on (much quicker). If you want to cut shapes, use the smallest cookie cutters you can find and dip the cutters in flour so that your dough doesn't stick. 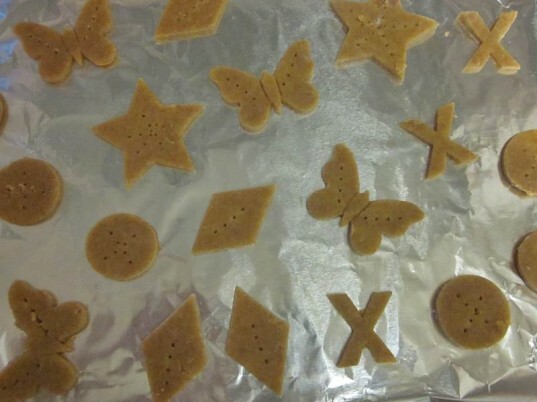 After cutting your shapes or squares, transfer the crackers to a prepared cookie sheet. You should line your sheets with a reusable baking liner or eco-friendly parchment. I was out of parchment so I used foil, which didn't work as well. Poke tiny holes in your crackers to combat bubbles and overly puffy crackers. These crackers were a hit at my house. My son and everyone else who tried them, loved them. They were hyper tangy. If you don't like so much cheese flavor, try using medium cheddar cheese or even branch out and try Swiss, Parmesan or another type. 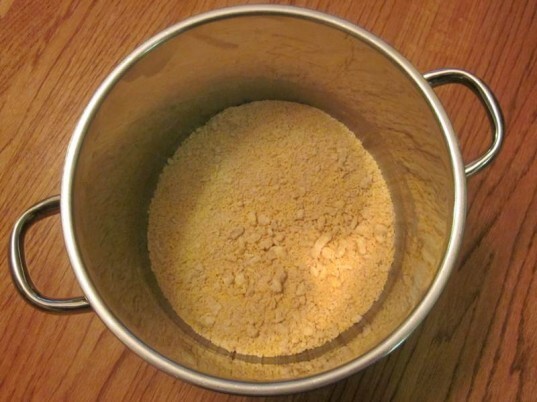 You can mix up the seasoning as well, for example, try Mexican cheese and a bit of chili powder. 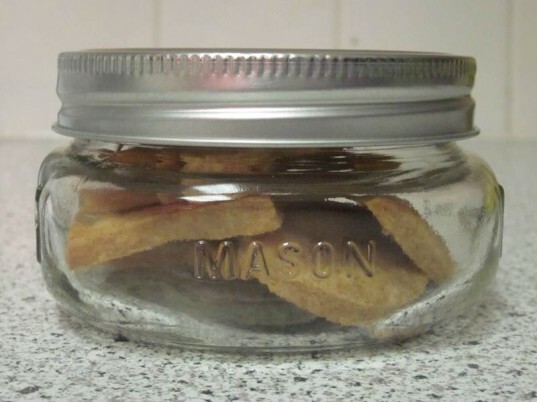 These crackers can be easily stored in cute little mason jars or other eco-friendly food storage containers. Your kids will gobble them up so fast, storage time won't be an issue.